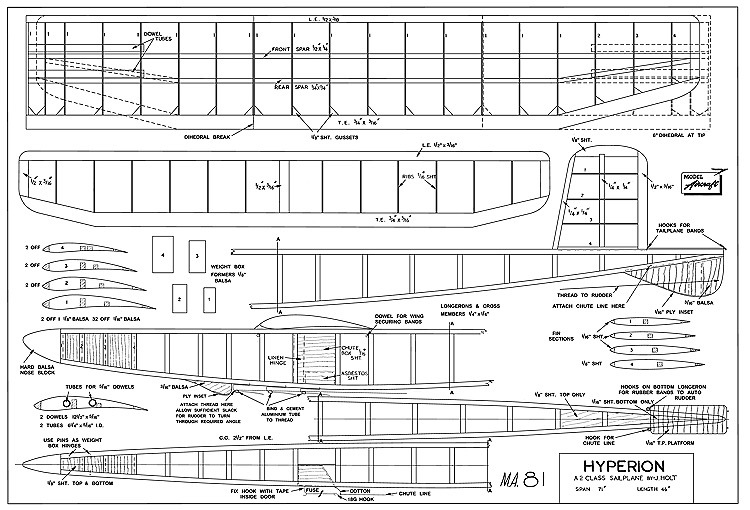 The Hyperion is 415.9 KB. Larger files take longer to load. This A-2 glider is probably from the late 50's or early 60's and includes a very deep under camber in the wings. the parachute DT with a more conventional stabilizer pop up which should be easily done due to the tail design. If you need to resize a plan please contact us with the ID:94484 and the desired wingspan. I will calculate a price upon request, please contact me here mentioning this PlanID: 94484 and the job you wish me to do. This plan is 415.9 KB and was shared by our member oldaainsp on 09/01/2016 03:31 in the PDF Bitmap Wood Model Airplane Plans (1) category.